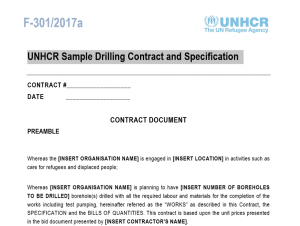 UNHCR has developed a sample drilling contract and technical specifications. These should be utilised for all drilling activities commissioned by UNHCR or its partners. The generic contract and specifications documents are provided in word format and should be modified to include the requirements that will be met for each individual work. In each document there is an indication of the areas that need to be modified.